Random Handprints - A NYC Mom Blog... live from New Jersey: Instructions for My Husband: Don't leave the dirty cookie sheet in the kitchen sink. Instructions for My Husband: Don't leave the dirty cookie sheet in the kitchen sink. The cookie sheet is very large and takes up the entire kitchen sink. And said placement of equally said cookie sheet makes it impossible for me to wash (or even find!) pertinent dishes that may be under it. In addition, a cookie sheet in the sink makes it impossible to pour anything down the drain, or in general to, uh, use the kitchen sink for any other possible use besides cookie sheet storage. This cookie sheet situation is particularly irksome when I discover it at the exact same time that I am also embarking upon making breakfast for two three fairly impatient and hungry children. Not to mention Mommy who likes to prepare her coffee sooner rather than later. * This second option is merely an example, and not really a viable possibility. This is my twentieth instruction for my husband in my ongoing series. The cookie sheet situation has been irritating me since 2008 when we had two impatient children. Now with three kids, it really annoys the hell out of me. That IS irksome! I may have to borrow this post. 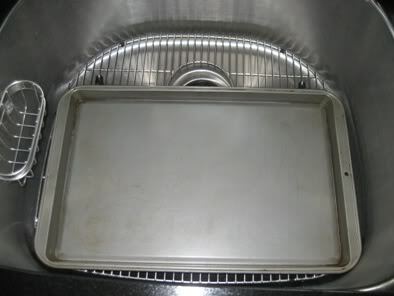 Though at our house, the cookie sheet would invariable be "soaking," which is code for "too effing lazy to actually wash the pan/milk glass/fork." Ha...you know what the worst is? When you go to move said cookie sheet with the water running and the water pours onto your shirt and onto the entire counter. Obviously my husband does the same thing! OOOOOO, damn straight this is irksome. Same goes for large pot lids and greasy pans. Because those homies have a way of splashing the water right back onto you...right after you finally bothered to get out of your pj's at 5 in the afternoon. Change "cookie sheet" to "pizza tray" and I am with you, sister!